The Blakemore Endowment Fund has two funds which offer college tuition support. The Dorothy Knowles Scholarship is open to all fields of study while the Guy and Margaret Smith Scholarship is open to students pursuing a service based career (i.e., counseling, teaching, social work, nursing, medicine, ministry). Applicants are not limited to Blakemore members but the candidates must be active in the United Methodist Church. The award amounts vary but generally are near $1,000. Applications are available below and in the church office. 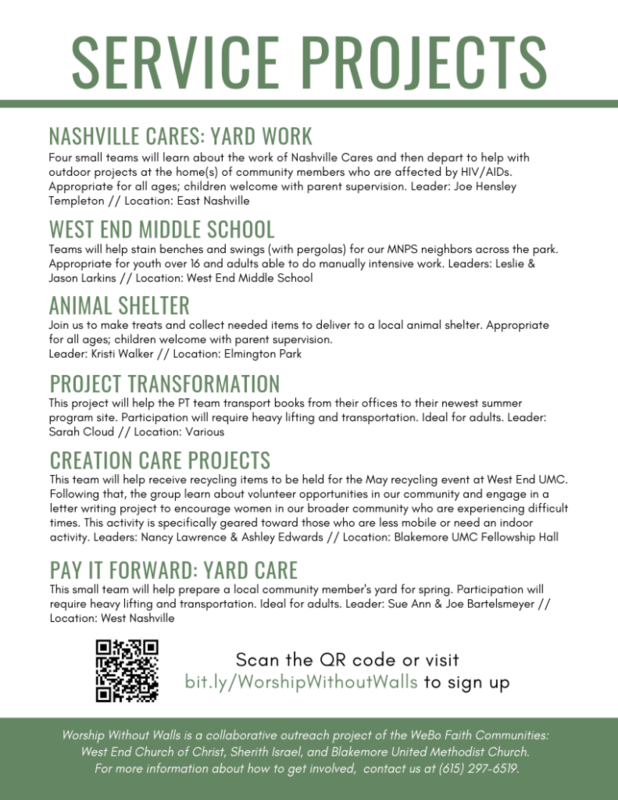 Completed applications must be returned to the church office (3601 West End Avenue, Nashville TN 37205) on or before May 15. If you are a previous recipient, you still need to complete the full packet with updated info. Please join us January 25-27 for the annual Women’s Retreat, hosted by Blakemore UMC and Clark Memorial UMC. More information can be found below. As we reflect on the ministries we’ve encountered in the past year, we give thanks to God for all we’ve been given. 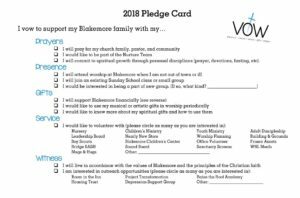 Use the links below to learn more about how you can share in these ministries of Blakemore UMC by your prayers, presence, gifts, service, and witness. 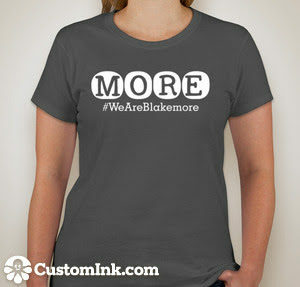 Interested in purchasing a Blakemore t-shirt? 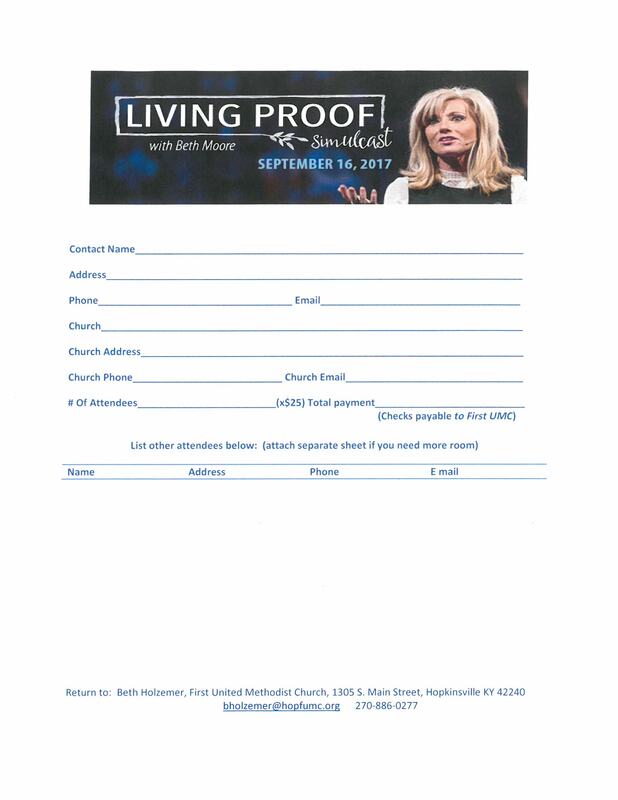 Use the editable PDF linked below to complete your order and e-mail to ashley@blakemoreumc.org. Payment can be made directly to the church office. People of all faiths and anyone else who cares deeply about protecting this beautiful, abundant earth and all living things sustained by it, are invited to a day of learning and strategizing about how to be better stewards of creation. A series of workshops will be offered throughout the day focusing on: (1) practical steps that local houses of worship can take to be better caretakers of the earth (reducing energy use; earth-friendly care of land; reducing waste; etc. ; (2) educational and worship resources that can be used in a variety of faith settings; (3) advocacy strategies for shaping public policy; and (4) models and strategies for integrating earth care into the life of your house of worship, including ways to have non-polarizing conversations about earth care that are based on shared values. The day will end with a short interfaith worship service. The cost (which includes lunch from local caterer Barley to Rise) is: $20 for Adults and $12 for Youths (ages 12-18) and College and Graduate Students. Child care for ages 0-5 is available for $5/child (see more about child care at registration site). If financial assistance is needed, contact Rev. Paul Slentz at pslentz53@gmail.com. Register at http://bit.ly/SacredCallingConference2017. Registration deadline is noon, Oct. 11. In addition to Tennessee Interfaith Power & Light (Nashville), the conference is co-sponsored by the Creation Care Ministry of the Tennessee Conference, UMC, and the Cumberland-Harpeth Audubon Society and numerous houses of worship. For more information, contact Rev. Paul Slentz (pslentz53@gmail.com) or Ms. Aimee Shelide Mayer (615) 760-1019. 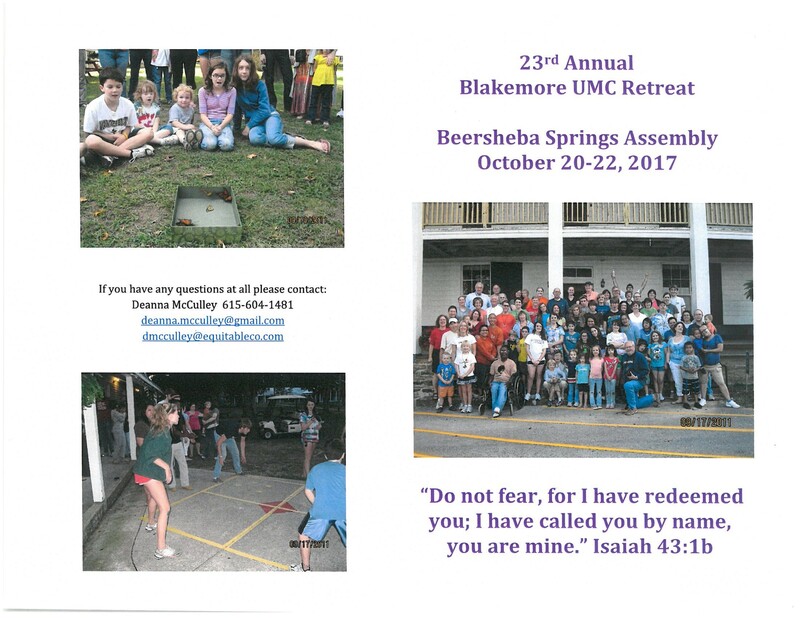 Each year, our Blakemore family gathers at the Beersheba Springs Assembly in Beersheba Springs, Tennessee for a weekend away from the regular schedule. Intergenerational programming and fellowship are on the schedule, along with time to explore the retreat center, hike nearby Greeter Falls, or visiting Beersheba Porcelain. 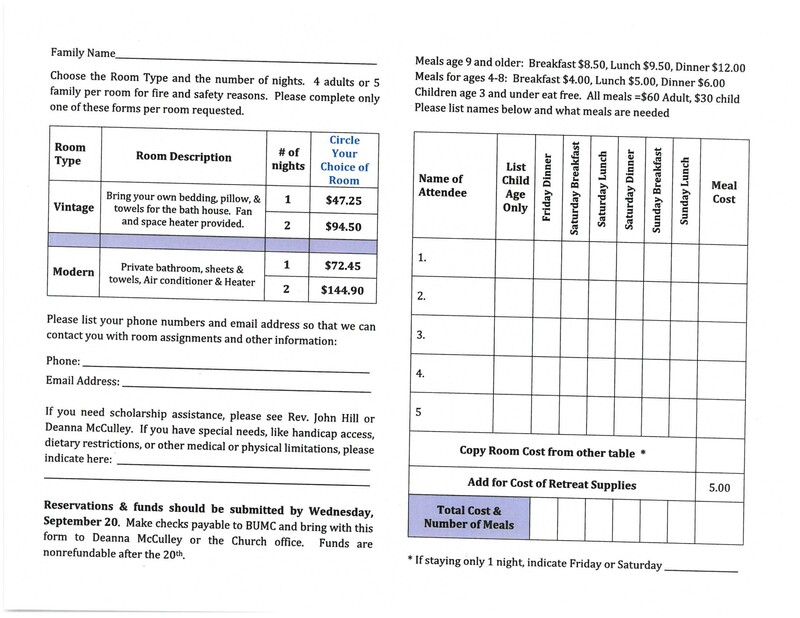 Brochures and reservation forms for the annual Church Retreat are available below. Please return forms to Deanna McCulley: drop them off in the church office or e-mail them (deanna.mcculley (at) gmail.com. 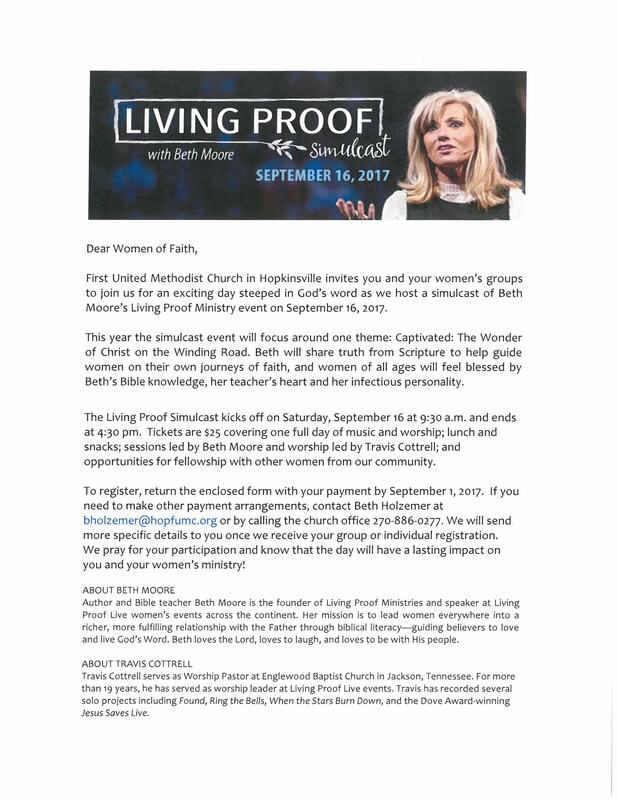 First United Methodist Church in Hopkinsville invites you and your women’s group to join them for an exciting day steeped in God’s word as they host a simulcast of Beth Moore’s Living Proof Ministry event on September 16th. For more information, see the images below. Monday morning began with worship in which Rev. Carol Cavin-Dillon preached an inspiring and convicting sermon about the parable of the Good Samaritan. She reminded us that it is normal to avoid messes and uncomfortable circumstances like the priest and Levite did, but we are called to be “weird” like the Samaritan and move toward suffering. The rest of the morning was filled with the standard business items of annual conference, such as reports about resolutions, standing rules, our financial situation and budget, clergy pensions, and the health plan. After lunch, we returned for two worship services. The first was the Memorial Service. Tom Nankervis was among those remembered. The second was the Retirement Service. Michael O’Bannon and Michael Williams, both former pastors of Blakemore, were among those celebrating their retirements. Michael O’Bannon listed four things he’d learned as a pastor, including not to eat chili on Saturday night. Michael Williams was, of course, humorous and gracious in his speech and paid a special tribute to Rev. Bob Lewis. We closed out the afternoon by hearing several reports about some of our connectional ministries, such as Warmth in Winter, Cedar Crest, Beersheba Springs, Wesley Foundations, Martin Methodist College, and Miriam’s Promise. Scott Chrostek, the pastor of the Church of the Resurrection’s campus in downtown Kansas City, was our speaker and teacher for Tuesday morning. He shared about his experience of planting a church in a downtown urban setting and urged all of us to move beyond the walls of the church to share God’s love out in the community. Most of the rest of the day was spent dealing with conference business. We adopted a $14.4 million budget for 2018, reorganized our standing rules, passed some resolutions, voted on constitutional amendments from the 2016 General Conference, officially reorganized the conference into five districts, voted to close nine churches (including 61st Avenue UMC) and allow two others to merge, decided not to elect new delegates for the called General Conference in 2019, elected folks to serve on various committees in the conference, and decided that we will meet at Brentwood UMC again in 2018. Conference ended on Tuesday evening with the Service of Licensing, Commissioning, and Ordination. We commissioned one missionary, licensed 23 first-time local pastors, commissioned four provisional deacons and seven provisional elders, and ordained six elders and one deacon in full connection. The one deacon was Gracie Dugan, who used to be Blakemore’s Minister to Children and Families. That, along with getting to stand with and lay hands on Chris Allen, whom I have mentored for several years through the candidacy process, as he was ordained were the highlights of Annual Conference for me. Powerful reminders of God’s call on all our lives and how we live out that call in connection and community together.